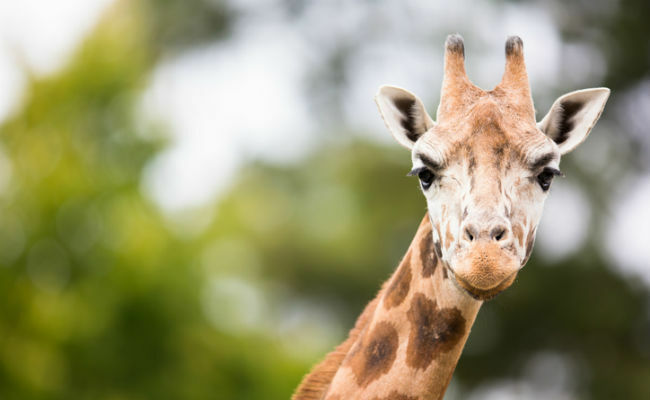 An international watchdog warns that falling giraffe numbers over the past 30 years mean that this iconic animal could be sliding toward extinction in the wild. Did you know that there are fewer wild giraffes than wild elephants? There are only 90,000 wild giraffes in Africa, and their numbers have dropped 40 percent since 2001 … Comparatively, there are an estimated 450,000-700,000 wild African elephants left? At the time, we highlighted that this extinction threat wasn’t on the IUCN Red List‘s radar — a fact that troubled conservationists. Wildlife specialists claim that without the giraffe, an important species in its own right, we risk losing several other species too. In September the IUCN recognized this challenge and adopted a resolution committing to giraffe conservation efforts. Now, the IUCN has issued new figures on this subject as part of the group’s update on its annual state of conservation efforts and discovery of new species. The report, which was released as part of the 13th Conference of the Parties to the Convention on Biological Diversity in Mexico, has now increased the number of species that the agency tracks. In total 85,604 species come under scrutiny, including hundreds of new bird species that previously had not been identified as distinct species. Of that total, the IUCN estimates that 24,307 species are threatened with extinction. Those figures offer an even clearer picture of just how beleaguered the giraffe population is that moment. But what is causing this species loss? Unfortunately, it’s not just one problem, so there isn’t necessarily a neat solution. One consistent pressure is the growth of human populations and resulting development. This gives rise to habitat loss, as human encroachment carves up the giraffe’s native lands. With that proximity also comes a dramatic rise in poaching via steel-wire snares or stalking operations. There was one glimmer of good news in this report, however: the smallest subpopulation of West African giraffes has risen over the last couple of decades, from 50 individuals in the 1990s to 400 at present. Two other small populations have also seen climbing numbers. That’s a considerable gain, and it illustrates that — when left alone — giraffes are a robust species with the potential to bounce back relatively quickly. Unfortunately, that figure isn’t enough to even dent the overall loss in numbers that the wider giraffe population has experienced. But poaching can be guarded against, so conservation organizations are calling on African governments for swift action to address the practice. For example, we have seen significant success in protecting elephants in this way. Decisive intervention at this stage could still save giraffes from the threat of poaching. Human encroachment, however, remains less easily tackled. To remedy this, African nations would have to restrict certain economically beneficial activities that they simply may not wish to curb. While the world has witnessed unprecedented action this year toward ending fossil fuel use – namely, the COP21 Paris climate change agreement — mining continues to be a significant source of income for several nations. And unfortunately, mineral extraction also contributes to habitat loss for the giraffes. Furthermore, land clearing and agricultural development also have an impact. Finding ways to address these problems without risking economic stability or outlook for African nations will be key in helping to protect giraffes. It may require international governments to explore ways to work with local communities and make giraffes worthwhile to their economies. Sadly, the plight of the giraffes isn’t the only issue identified by the IUCN this year. Indeed, its figures seem to suggest that the mass extinction event scientists have been warning about is taking hold. Many species are slipping away before we can even describe them. This IUCN Red List update shows that the scale of the global extinction crisis may be even greater than we thought. Governments gathered at the UN biodiversity summit in Cancun have the immense responsibility to step up their efforts to protect our planet’s biodiversity – not just for its own sake but for human imperatives such as food security and sustainable development. The giraffe’s plight seems to be emblematic, then, of many other species that are now at risk of slipping away. The good news is, we’ve caught the giraffe’s decline at a time when it is reversible. With immediate action, we can ensure that these giants of the African wilderness stay with us for many more years to come. Patricia Harris (from 3 days ago) You are right, I don't know this for sure. But I am very frightened that it is going to happen - not frightened for humans but for all other species. We have the power of protest which is what we do on Care2 and at rallies. But I don't know what the extreme measure are. Voting obviously didn't work. Rioting isn't the way to go nor is violence. Our protests worked in the 60's but the riots were over the top. Protests do work but there have to be thousands out protesting and since the 60's people don't seem to feel involved enough to do that at least not in large numbers. Now with this "election" there are more enraged and outraged people than there have been since the 60's but Trump doesn't even listen to himself much less anyone else. He's paying no attention to the petitions Care2 and others have sent and demonstrations will just make him call out the army though, believe me, I an NOT suggesting we not take to the streets and protest. We NEED to do that. He just doesn't respond to reason. He doesn't seem to have the capacity to reason. I hope the electors will not give him the 270 he needs - if they vote responsibly. But if they don't we're sol. He will pull out of the Paris Treaty and do as much of what he has said as he can and I really don't know what we can do to stop him. Fred L,. ''It's only going to get worse in the U.S. with Trump the president-elect.'' Not if we get rid of him, first! That's the whole point! As I've said before, it's just as much our fault that the animals are dying and the environment is being destroyed, as it is those who're doing all the damage, because we are letting them get away with it despite our passion/love for the planet and all it's animals. We NEED to stop acting like we're just as bad as those destroyer and the governments who just sit there idle as the damage worsens!!! If we're going to be heroes, if we really want to leave a legacy behind that our children expects, well then, we need to do the things that we both agree that needs to be done. We may only be in the minority, but if we REALLY want this madness to end, then we're going to have to go through extreme measures. We really don't have much of a choice. Patricia, it appears that you're hating on those who have different opinions than yours on what can, and cannot be done, to help stop the loss of wildlife. I'm one of those who thinks the biggest problem is the cancerous growth of the human population, and the concomitant loss of wildlife habitat. I do as much as I can to help Mother Nature, i.e., voting for the most environmentally friendly politicians, picking up as much trash (especially plastic) as I can, and being conscious of my use of resources. But those are just gestures of love and respect for Mother Nature, that can't really compete with the Big Business-bought politicians and their policies. It's only going to get worse in the U.S. with Trump the president-elect. Patricia, if you have any suggestions other than "buck up," let's hear it. Thank you, Annabelle! It's nice to know that I'm not the only one who thinks we should do something and actually do it... Foolishness is spreading like the plague, and it seems to be infecting this wonderful site as well. Care2 is NOT for losers, haters, and/or traitors! Okay guys, listen up!! I really think we should start taking Patricia's words seriously. We have GOT to start pulling ourselves together! The damn government is NOT the only group of people that needs to take action, you're just as responsible for the planet as they are, so STFU about the situation being hopeless, and start turning the situation into something positive! If the situation continues to worsen, you're just as much to blame for your inactions as it is the government is.